The bar at the Basketweavers Arms in Brighton. There’s something almost magical about a really good pub. When I say “really good”, I don’t mean the ones with fancy cuisine (top rated in the latest pub food guides) or a vast range of beer, wine and spirits. “Crap pubs” my younger sister Nancy calls many of those places. Trying too hard. As with so many rewarding and deeply English customs, the key to a really good pub is tradition. And that’s a very difficult one to unpack. Unlike fine French, Italian and Chinese cuisine or the fabled American burger, the great British pub isn’t an easy thing to export nor replicate. Something about it is organic, or as we Americans like to say, authentic. If you have a favorite pub it’s “your local.” Regulars have a sense of ownership that has little to do with the money they spend. A really good pub works because of “the punters” – the personalities who inhabit the place each evening. They know the customs and rituals. They supply the hum of laughter, conversation, even argument. Perfection it is not. A really good pub works because of the beer. A perfectly pulled pint is a thing of beauty. Neither ice cold (perish the thought!) nor room temperature warm, the ideal pint of beer goes down smoothly: the perfect balance between fizzy and flat. Half way down. 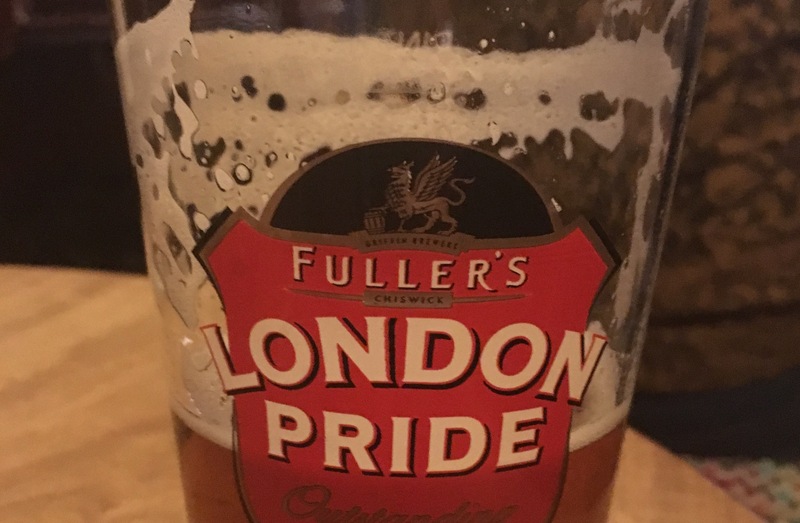 A glass of Fullers London Pride. And here’s the thing. I don’t really like beer anywhere else than in a cozy British pub. The mix of chatter at the tables nearby and a good humored, but not too friendly bartender makes the suds go down easy. It’s all about balance. So easy to get that one wrong. My sister Lucy knows. She was a publican for a decade. Being the landlady of a village pub in Somerset was “bloody hard work.” On her feet from morning ’til night. The place was open every day of the year. The routine included an exhausting mix of joy, laughter, friendship and even a certain amount of status. But it often came with physical pain. Challenging too. Managing the menus and bar staff was no easy feat. Not to mention the finances. 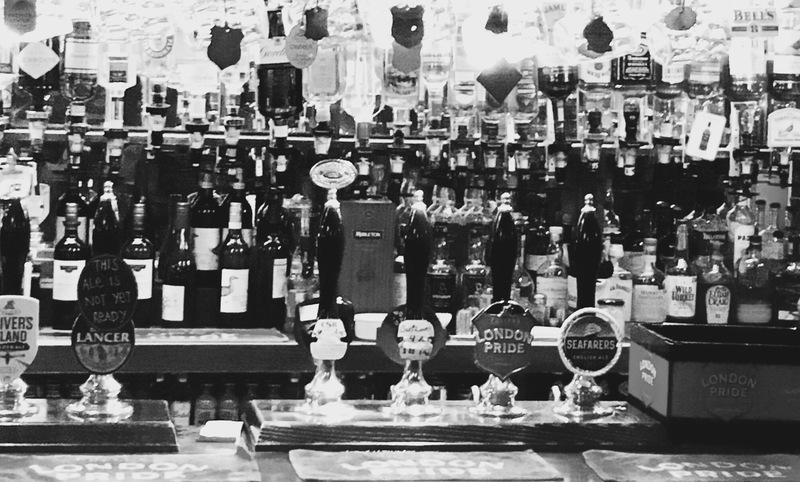 Because of a decades-long decline in custom, being a publican is often a struggle. Many public houses have shut down. In the past English pubs were home away from home. When the telly was black-and-white and your indoor heating was iffy at best, the pub was a warm, welcome retreat. Today, with inexpensive wall-to-wall carpeting, large Samsung flat screen TVs, wifi, Netflix and yes – adequate heating – many modest English houses and flats have been transformed. Vast numbers of folk don’t go out much as their parents, uncles and aunties did. Successful pubs are increasingly rare. But when you find one, dropping into an English local is a real treat. A place where you’d be missing out if you didn’t go in for “a quick one”. How Do We Fix It As We Leap Over a Cliff? It’s almost as if you can hear an audible shuffling of papers and clearing of throats, as the great and the good struggle to explain how great events might unfold in 2017. Most of them – us really – were so wrong about remaining in the European Union or the inevitability of Hillary. We have no idea exactly what is coming next. It’s well past time for a little humility. What indeed? The usually bold and confident Governor didn’t seem to have much of an answer. How much damage will the Brexit vote do to the U.K. economy? It seems that the economic forecasts change almost weekly. After dire predictions during the summer of a great slowdown, promoted by uncertainty over the implications of the Brexit referendum, Britain should finish the year as the fastest growing economy of the G7 economies – according to a survey by Scotiabank. The Bank of England recently upgraded its outlook for the near future. What will Donald Trump do to the environment and America’s standing in the world? The omens are not good, but it’s hard to know if America will be the laughing stock when so many other countries are facing a similar challenge. The voters smashed the china and there is very little agreement – here or back home in the U.S – on how it’s going to be put back together again. As “The Thunderer” (aka The Times of London) said in a recent editorial, it is not business as usual. OK this is it. Final thoughts on my trip to England. The blue rooster on the old grey rectangular plinth once reserved for a statue of a long-dead member of Britain’s ruling class near Nelson’s Column, is an example of how many here would like to think of themselves. Fun, a little bit excentric, but very much in touch with their roots and proud traditions. Irony, wit and a love for language are delightful ingredients of English conversation. In newspaper columns and on the BBC there is often a pleasing irreverence that is missing from our more earnest commentariat. 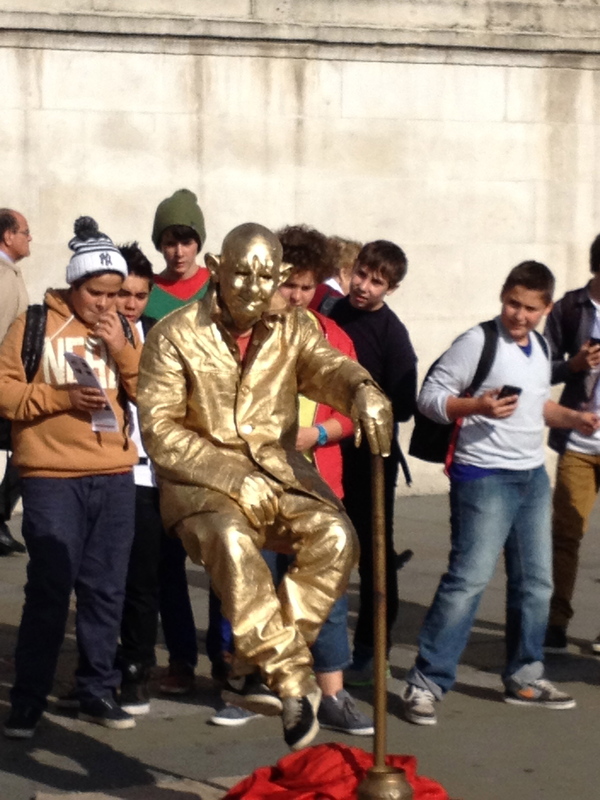 From West End theater and the enormous London Eye, to street performers dressed in gold relaxing on invisible chairs in front of gasping crowds, there is much to amuse tourists. All very fine as far as it goes. But scratch beneath the jolly surface and you will often find service not with a smile, but through gritted teeth. The impossibly rude hotel manager Basil Fawlty still lurks somewhere in the English soul. While this may sound strange coming from a guy lives in New York, many English people do have a problem with sincere good manners. When New Yorkers say “thank you”, we usually mean it. Not here. There’s often a shocking insincerity on display, especially from the comfortable classes. One of many examples I witnessed in the past few days was in the foyer of a modern London office building. “Oh, you are so extremely kind,” said a posh chap with an apparent straight face to the uniformed security guard, as he was allowed through metal turnstiles despite failing to present his corporate ID. Did the man with tailored suit and silk tie mean what he said? Not a chance. The owners of the country bed-and-breakfast where I stayed last weekend threw a late-night party for a bunch of loud friends right below my bedroom. There was no hint of apology the next morning. Cell-phone conversations on commuter trains are often long and loud here. And while that often happens on Metro-North, the English pride themselves in being proper and polite in a way that few Americans would claim to be. Did any of these minor wrinkles spoil my trip? No way. I still love it here. But a little more warmth and spontaneous kindness would not go amiss. What’s your view of the English? I’d love to hear it.